Hello, You have to use your computer to keep safe and store your day to day important jobs, but lot of time you have to face slow performance of your computer system and that time you have to wait to finish any running task. Here is some tips to increase Computer Speed. At present time each person has separate computer, laptop or notebook either in his home or in the office. If you are watching any video or movie or do any important work on your computer and your computer will be too slow in that case you will be frustrated. In that condition either you will format your computer system or increase RAM or change your computer motherboard or processor, but all these will be expensive and you important time will be lost. 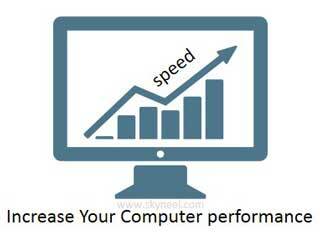 In that situation a question is arise how to speed up or boost up speed of your computer system, so in this article we have to discuss about few important tips and trick from which how have to take few important steps from which you can easily increase computer speed. You have to keep in mind few important tricks from which you can boost up or increase computer speed. Due to the lack of proper knowledge most of the person installs different unwanted programs in his computer, due to which your computer start-up program list will be increased and when you start your computer these programs are automatically on and your computer will be hang. There are few unwanted programs which most of the users install in his start-up program list are Analog Digital Clock, Screen News Feed, G-Talk, Skype, Bit Torrent and many more. You can remove these programs from your start-up list to increase computer speed. Step 1: Open run box either pressing WIN+R key or you can also click on the Run command from the start menu. Step 2: Type msconfig in the run box then press enter or return key, this will open system configuration dialog box. Step 3: Click on the Startup tab in the System Configuration dialog box > Remove check mark from those programs which you want to remove from the startup items list. Step 4: Click on the Apply button > finally, click on the OK button. All we know very well that operating system and all the important programs or software are installed on C: drive of your hard disk. If you install lot of unwanted programs on the C: drive then your computer will be slow. So always keep in mind remove unwanted programs from the c drive of hard disk and also keep store your important and personal data on another drive of your hard disk. Most of the persons are crazy for HD games but they feel problem when they want to play any HD action or adventure games on his computer, due to the slow speed of your computer. To avoid that type of problem you have to upgrade all graphic drivers on your computer system. After upgrading graphic drivers on your computer you will be able to easily play any HD action games without any problem. We know very well at present time hackers remove your confidential and important data and they also crash your computer system security with the help of few mischievous illegal programs and these programs are called virus. If you want to protect your computer with these virus attacks then you have to install any one updated antivirus program on your system. But most of the person installs more than one antivirus and firewall programs on his computer system which reduce your computer working speed. So, always remember if you want to speed up your computer then you have to remove more than one antivirus and firewall programs from your computer immediately. One important thing you always keep in mind you have to use any registered antivirus programs in your computer, because if you have to use any unregistered antivirus program then your system not properly clean your entire hard disk and also not able to remove of virus. So, install any registered or full version updated antivirus program on your computer. During updating programs on your computer system most of the files will be corrupted and these unwanted corrupted files take lot of space of on your hard disk. So, to increase computer speed during scanning of your computer system if you found that type of files either you have to repair these files or delete them from your computer. Lot of person installs unwanted programs or software in his computers which are not useful for you. These unwanted programs take lot of space on your hard disk so remove all these types of unwanted computer program from your computer. If you want to check or remove corrupted files or unwanted programs then you have to open Control Panel > Click on the uninstall or change programs option > Remove or repair one or more corrupted system files with the help of System File Checking program on your computer. If you have old generation computer hardware parts then you have to update your all hardware parts like Processor, RAM, Motherboard, Cable, SMPS etc. If you want to run any latest program on these old computers then you have to face slow speed problem. So, always update all hardware and software on your computer system to boost up your computer. If you have old hardware parts and you have to use windows 7 or 8 operating system on your computer will be slow because this operating system will take lot of space on your hard disk so you have to use Windows XP operating system at the place of windows 7, 8 or vista operating system on your computer. If your desktop area will be clutter up with unwanted files then your computer speed will be slow. So, remember there is no need to store any unwanted files on the desktop area, immediately remove that type of files, folder or any shortcut from the desktop area. If you take care of all these important things then you will never face slow speed problem on your computer. So, use these steps and increase computer speed. Give your important suggestions regarding this article in the comment box. Thanks to all.